A new SW groundswell filled in yesterday with good 3ft sets on the Surf Coast and 6ft waves on the Mornington Peninsula but moderate to fresh onshore winds persisted across both coasts. This morning the swell was holding a similar size to yesterday but the relentless onshore winds eased back enough to become variable across the Surf Coast, creating the cleanest conditions we've seen since Saturday. The Mornington Peninsula was also cleaner but still less than perfect with a light onshore S'ly breeze. Tomorrow a touch more size should be seen across both coasts as a mix of long-range and very inconsistent as well as a medium-range SW groundswell fill in. These swells were produced by a strong polar frontal system developing in the Heard Island region over the weekend before pushing east along the polar shelf and under the country. Inconsistent 3-4ft sets are expected across exposed spots on the Surf Coast with 6ft+ surf on the Mornington Peninsula. Conditions will be best east of Melbourne with a moderate NE breeze tomorrow morning that'll freshen from the E/NE into the afternoon. 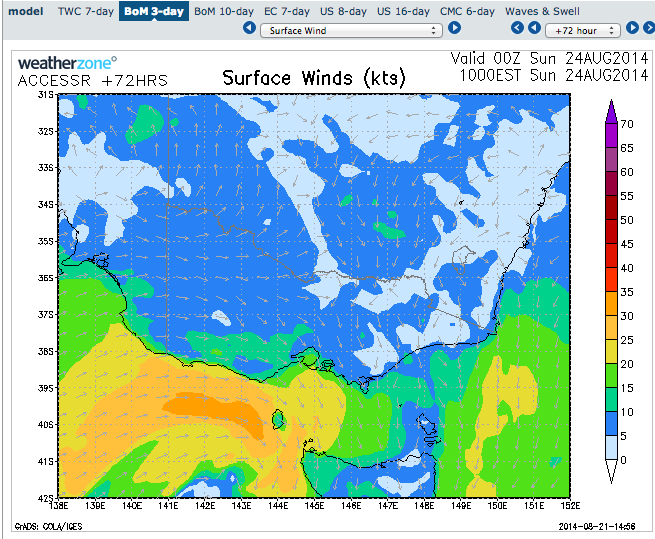 Friday will be better as the swell drops steadily from an inconsistent 3ft on the Surf Coast and 5-6ft on the Mornington Peninsula under generally N/NE winds, but the Torquay region should see early N/NW winds, opening up a couple more options. 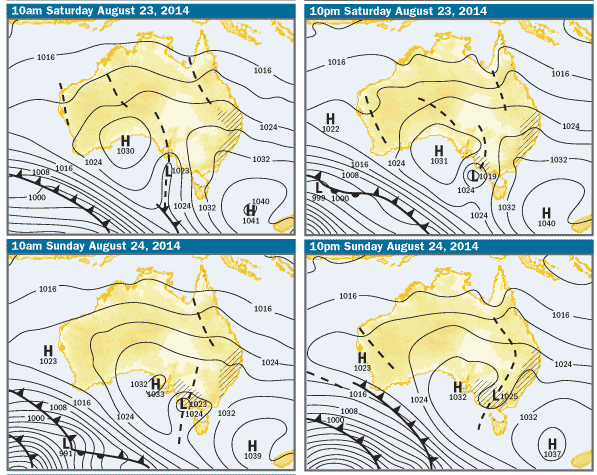 So get in early for the biggest and best conditions west of Melbourne. The swell is still due to bottom out Saturday, becoming tiny on the Surf Coast and best east of Melbourne with inconsistent 2-3ft sets on the open beaches through the morning under fresh and gusty N/NE winds. Into Sunday a very long-range and very inconsistent but strong W/SW groundswell is due to fill in across the state, generated in the Southern Indian Ocean. Currently a very strong, broad and elongated polar front is being steered up towards WA by the Long Wave Trough before weakening considerably once if passes across WA on Friday. 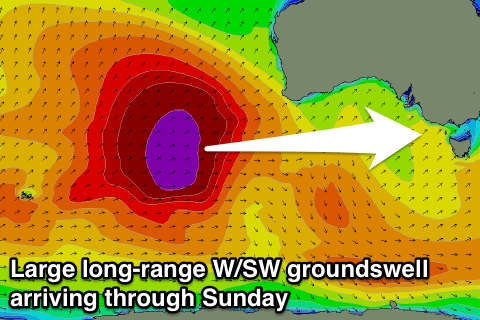 An oversized W/SW groundswell will be generated for WA, with a fair bit of swell decay seen as it travels towards us. Still the sheer size of the swell should still result in moderate levels of W/SW groundswell impacting us on Sunday, peaking through midday and into the afternoon to 3ft on the Surf Coast, with 4ft bombs at Bells/Winki and 13th Beach, while the Mornington Peninsula should see 6ft waves with the odd 8ft bomb. Winds will be best west of Melbourne with a fresh and gusty NW'ly ahead of a swing to the W/NW into the afternoon. The swell should start to dip through Monday but this easing trend will be softened by a couple of reinforcing W/SW groundswells filling in Monday afternoon and then Tuesday morning, generated by a pre-frontal fetch of severe-gale W/NW winds moving in quickly behind the original storm and dipping south-east towards the polar shelf. While not ideal the Surf Coast should continue to offer 3ft sets Monday before easing from 2-3ft Tuesday, with the Mornington Peninsula easing from 4-6ft Tuesday morning. Winds will unfortunately take a turn for the worse though as a weakening trough moves in across us with S/SW winds due Monday and then more variable winds on Tuesday, but we'll confirm this Friday. Longer term, another similar but likely slightly smaller long-range W/SW groundswell is due Thursday across the state under winds from the eastern quadrant. More on this Friday though. The weather models have been moving around slightly regarding a weakening front/come trough moving in from the west over the weekend. The current charts updated around 12pm is the 18z model run and it had the trough weakening and pushing across us, bringing weak SE winds. The latest 00z update which has just gone through has the trough supporting a weak low and swing back to my forecast of N/NW winds Sunday morning (there's a chance they may swing light SE into the arvo). At 6pm today the charts should be refreshed and you'll see those offshores again. It's a real tricky system and could still change a little but I'm more confident on the N/NW winds Sunday morning now.